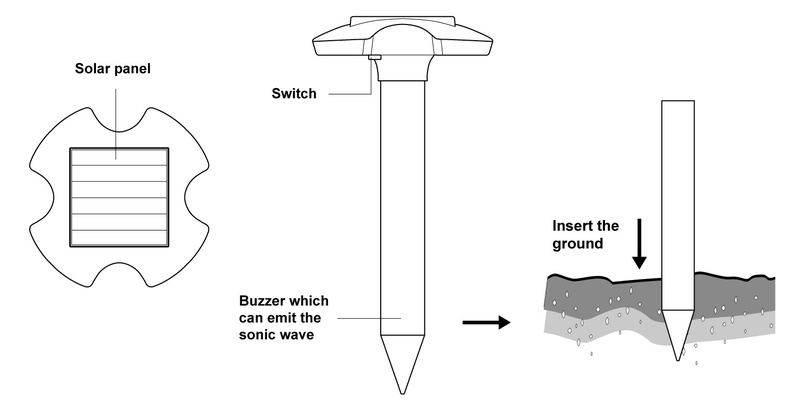 The Solar Mole and Snake Repeller is designed to safely and effectively repel underground rodents and snakes by using sonic vibrations. This repellers scare the pests, making them flee the area. This repeller has an effective range of up to 7,000 square feet. For best results, place one solar sole repeller every 100 feet in affected areas. The on-board battery can store enough energy to power the unit for several days of little or no sun; in some cases up to one full week. Power Supply: Rechargeable 1.2V AA battery and solar panel. Repeller Frequency: 400Hz-1000Hz, signal escalates across range for increased effectiveness. IMPORTANT!!! Do not dig into the ground until you have checked for underground cables or wires. Check with your local utility companies to ensure that you locate and mark any underground utilities before installing. Failure to do so is very dangerous and could result in personal injury or death. NOTE: Check the ground before installing the device; frozen or waterlogged ground is not recommended. First, bore or dig a small hole to make room for the device. DO NOT use a hammer or excessive force when installing. Choose a location that gets plenty of sunshine, this will ensure full charging of the batteries and better results. 1) Pick a location free from shade and cover, then dig a hole in the ground to place the device. 2) Insert the stake (bar) into the ground, make sure the top is above to the surface roughly 1 inch. Place soil around the unit, securing it in the earth. 3) For normal operation, press the switch “ON/OFF”. NOTE: For first time use, leave power switch “OFF” for 2 full days of sunlight to charge.